I just wanted you guys to know that I really am trying. 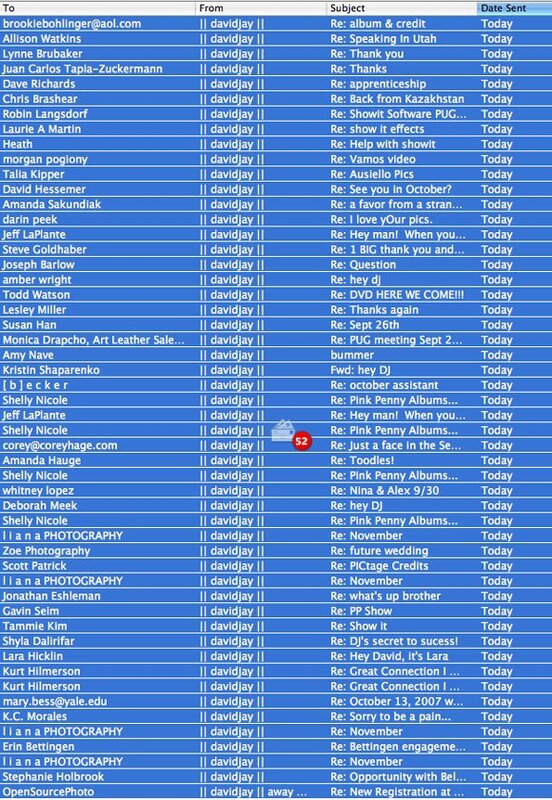 I sent 52 emails today but I still have 134 more to send out dating back to June 8th. Whoa. ..and I just found an email from a bride wanting me to shoot her wedding next year but her email was on August 1st so I don't think I'm gonna get that job. Oh no! That happened to me last week but luckily the email was only 2 weeks old and the girl was really understanding. We're supposed to meet next week. Good luck with the rest of the email! Just wait until you find that email from me... that said I had a million dollars for you if you wrote me back within 48 hours. Welp, too bad for you!! I gave it to someone else. No wonder you didn't make it to the surprise party! Talk about WOM in FULL ACTION!!! "..and I just found an email from a bride wanting me to shoot her wedding next year but her email was on August 1st so I don't think I'm gonna get that job." haha....did I miss a party! Shoot! You must be like Bill Gates... $623,000 earned every minute of the day! I think I speak for everyone here when I say that we understand that you can't respond right away. You are a busy guy. If you need an e-mail assistant, I will be in the job market after my graduation.